Rostron Lacey was born in Rising Bridge on 13 November 1892. He was the son of George and Mary Lacey of Worsley Street, Rising Bridge and was baptised at St. James’s Church, Haslingden on 29 January 1893. In 1901, Rostron was living at 1, Rising Bridge Road with his parents and sisters Elizabeth Ann and Florence. On 6 January 1916, Rostron married Bessie Heap at St. James’s Church, Haslingden. His family at that time lived at 187, Maudland Bank, Blackburn Road, Haslingden. He was a member of Haslingden Church Lad’s Brigade prior to the war. He was a weaver at Britannia Mill when he enlisted in November 1915, and he went to the front in the following March. He was a well- known boxer and won the Battalion welterweight championship at the front towards the end of 1917. Rostron was reported wounded and missing since January 1918, when he was recommended for distinction for gallant conduct. His wife, Bessie, at that time lived at 168, Blackburn Road, Haslingden. 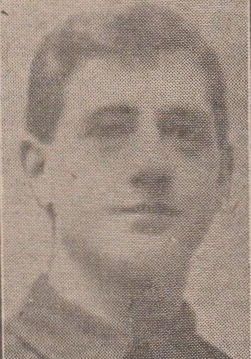 Roston was finally officially reported killed in action near Ypres on 9 January 1918. He was 25 years old. As Rostron Lacey’s body was never found, his name is commemorated on Tynecot Memorial to the Missing, Belgium (see below). A memorial service was held for him in St. James1 Parish Church, Haslingden on 3 November 1918. The following article appeared in the Haslingden Guardian 15 February 1918. “The wife of Corporal Rostron Lacey, K.R.R. who lives at 163, Blackburn Road, Haslingden, has been informed that he is reported wounded and missing and that he has been recommended for the Military Medal. His lieutenant-colonel writes that Corporal Lacey was wounded during a raid on the enemy trenches and is reported missing. The officer adds that Lacey behaved in a very gallant manner, and that his courage and fortitude were an example to all, and well worthy of the best traditions of the regiment. The chaplain of the company states that Corpl. Lacey did the most splendid work, killing two sentries and throwing bombs indefatigably. Returning, he had got some 20 yards from the German position when he was hit in the groin by a machine gun. As soon as the party got to the British lines an officer took out some stretchers to bring Lacey in. The officer was killed and the party broken up by enemy fire. A patrol went out but could not find Lacey and it was feared that he must be in German hands. The Captain does not hold out much hope to Mrs Lacey, as he says his wound was serious. The captain adds- “He was one of the best NCO’s in my company, and I had only just promoted him to Corporal. I had the greatest respect and regard for him as a man; he was cheerful and willing under the worst of conditions, and he set a fine example to everyone and had the respect of all". Mrs. Lacey, 168 Blackburn Road, Haslingden, has received a War Office notice presuming the death of her husband, Corporal Rostron Lacey, who has been missing since January 10th 1918. We reported in our issue of February 15th at Corporal Lacey had been wounded and was missing and that for gallant conduct had been recommended for the Military Medal. Since that time nothing further has been heard of the young soldier and as stated above he is now presumed dead on or since January 10th. He was 25 years of age and was a weaver at Brittania Mill when he enlisted in November., 1915, and he went to the front the following March. He was a well known boxer and won the battalion welterweight championship at the front about the end of 1917. The wife of Corporal Rostron Lacey, K.R.R., who lives at 163, Blackburn Road, Haslingden, has been informed that he is reported wounded and missing and that he has been recommended for the Military Medal. The company-major states in a letter to Mrs. Lacey that her husband's gallant conduct has been recognised, and that he has been awarded the Military Medal. He adds:- Everyone is so glad that his conduct that night was recognised and that the medal be so well deserved has been given." The chaplain of the company states that Corporal Lacey did the most splendid work, killing two sentries and throwing bombs indefatigably. Returning, he had got some 20 yards from the German position when he was hit in the groin by a machine gun. As soon as the party got to the British lines an officer took out some stretchers to bring Lacey in. The officer was killed and the party broken up by enemy fire. A patrol went out but could not find Lacey, and it was feared that he must be in German hands. The captain does not hold out much hope to Mrs. Lacey, as he says his wound was serious. The captain adds:- "He was one of the best NC.O's in my company, and I had only just promoted him to corporal. I had the greatest respect and regard for him as a man; he was cheerful and willing under the worst of conditions, and he set a fine example to everyone and had the respect of all." Corporal Rostron lacey is 25 years of age, and he was a weaver at Brittannia Mill when he enlisted in November 1915. He went to the front in the following March. He is a clever boxer, and won the battalion welterweight championship at the front two or three months ago. In Loving Memory of our dear Son, Cpl R. Lacey, 13th Batt., K.R.R., wounded and missing 10th January, 1918. We are only parted for a little while. God knows best, "Thy, will be done." From his Loving Mother, Father, Sister and Niece, 167 Maudsley Bank.